In today's diverse world of design, layout and formatting, choosing the right template for your printed piece is essential. Not only does it ensure that the borders, bleeds, fold dimensions and margins are precise and print correctly, it can also save you time and frustration. Our easy to use InDesign brochure templates will make it easy for you to make sure your panels line up perfectly every time. 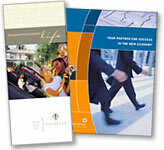 Below are several commonly used InDesign brochure templates with template fold and layout dimensions. One of the most popular and common folds, the Trifold, is used frequently for informational brochures, product sheets, flyers, and take-out menus, and it fits well into a standard #10 envelope. Please click on the size that matches your printed piece for your correct InDesign brochure fold and layout template. An open or closed gate fold, while less common, is a visually interesting way to showcase your product or services. Real estate sale sheets, photography and menus are all perfect candidates for a gate fold. Open and closed gate folds can be tricky to lay out, so be sure to use one of our InDesign templates to ensure an accurate finished piece.